Would you like to own unique objects that are a reflection of who you are? Objects that you do not want to find at your neighbors? Objects that will respond to certain specific needs you might have without having to pay too much? Well, thanks to 3D printing, it's all quite possible! 3D printing allows you to customize objects to give them a specific character (size, shape, color, function, etc.). Thus, it is quite possible to decorate your home and equip yourself with the type of objects you desire at a lower price. Nowadays, the quality of 3D printers for the general public and home use offers the possibility of creating very detailed and exquisitely beautiful pieces. The possibilities are almost endless thanks to the many models available across all existing platforms on the Web. And if you don't like the models available on the Web, you can build your own, using widely available CAD software. ​ From decorative objets to useful accessories for the kitchen or the bathroom, 3D printing will allow you to customize your objects to give them a specific character. There are 3D printers of various complexities designed for various purposes, from home and school use, all the way to industrial applications. This article will focus on two of the best and most popular 3D printers that were designed for home use: the Dremel 3D20 Idea Builder and the FlashForge Finder. These are both affordable, very safe and easy to use, and as such, they are perfect starter 3D printer for families, schools as well as novice users. They both come with complimentary software that allows you to prepare the models to be fed to the printers. Prepare a 3D model on your PC: To prepare your model, you can either design it from scratch using free CAD (computer-aided design) software such as 3DTADA, AutoCAD, etc., or you can download specific models from various publicly available websites. Slice and export the 3D model: Slice software is used to prepare the selected 3D model for printing and turns them into instructions to be fed to the 3D printer. 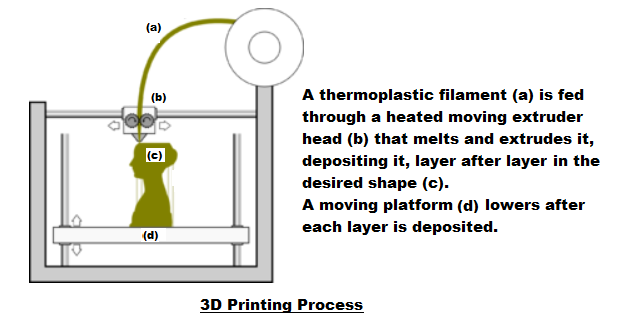 Once sliced, the model can be fed to the 3D printer by connecting your computer to the printer using either a USB connection, Wi-Fi or and SD card. This article will compare in the detail the features of: Dremel Digilab 3D20 Idea Builder and FlashForge Finder 3D printers. With Dremel 3D20, you will be able to start printing very quickly and easily because the unit comes completely pre-assembled with very clear setup instructions and with a 0.5kg spool of PLA filament included. The open system gives you the ability to download and print free models from around the web, but you can also use your imagination and any CAD software to create your own designs. It is also a very safe printer thanks to the fully enclosed design, non-heated build plate, PLA-only printing and 3rd party UL safety approval. Note that every Dremel 3D printer has been thoroughly tested to ensure reliable printing, which makes it one of the most reliable consumer-grade 3D printers on the market. Printer Overall Dimensions: Height: 15.7", Width: 19.1", Depth 13.2"
Build Volume: Maximum Build Height: 5.9", Maximum Build Width: 5.5", Maximum Build Depth: 9"
Fully Enclosed Printer: Yes. Dremel 3D20 is fully enclosed to maximize the printing success rate by creating a stable temperature inside. This also improves safety by preventing children from sticking their hands into the work area during prints. Number of Extruders: Single.​ The Extruder is the device that draws the filament from the spool, melts it and pushes it through a nozzle into the build plate. Color Touch Screen: Yes. The 3.5-inch full color LCD IPS touch screen allows you to interact directly with the printer through its full-color LCD touch screen. The interface allows you to modify settings, lookup files in the SD card, and print in a smooth fashion. USB Connectivity: Yes. You can connect your computer to the printer with a USB cable. SD Card: Yes. You can use your SD card (up to 32GB) to load printable files to the printer. Free Slice Software: Yes. The complimentary software converts your selected 3D digital model files into file formats ready for printing. Then the files can be transferred from your PC to your Dremel 3D20 printer via a USB connection or using the SD card. Safety Certification All Dremel 3D printers are UL certified to ensure safety and quality. ​FlashForge Finder is the other very popular, easy to use, and very affordable 3D printer that comes fully assembled, with plenty of nice features, and designed to be used both at home and in classrooms. Indeed, many consider the FlashForge Finder to be the first choice for 3D printing novices and educators. In particular, the slide-in build plate, assisted bed-leveling, and intuitive color touchscreen are the three charateristics that make this printer very user-friendly. The quiet and safe operation of the printer is very much appreciated by both parents and teachers. Note that it uses strictly non-toxic PLA filament, and the heated components are well encased, so this printer is very safe to use. Printer Overall Dimensions: Height: 16.5", Width: 16.5", Depth 16.5". Build Platform Dimensions: Height: 5.5", Width: 9", Depth 13.2". Build Volume: Maximum Build Height: 5.5", Maximum Build Width: 5.5", Maximum Build Depth: 5.5" . Layer Resolution: 100-400 microns (0.004-0.19 inches), adjustable. Nozzle Diameter: 0.4 mm (0.015 inch). Fully Enclosed Printer: Yes. FlashForge Finder is fully enclosed to maximize the printing success rate by creating a stable temperature inside. This also improves safety by preventing children from sticking their hands into the work area during prints. Number of Extruders: Single. The Extruder is the device that draws the filament from the spool, melts it and pushes it through a nozzle into the build plate. USB Connectivity: Yes, with a USB stick that can be used to transfer files. ​Wi-Fi Support: FlashForge Finder features the 2nd generation Wi-Fi connection with more stable wireless file transmission. And now you can send 3D files from your computer to the printer's 8GB memory with your own Wi-Fi network. You can manage your 3D printing from anywhere using Polar Cloud. FlashForge Finder comes Polar Cloud Enabled straight out of the box, meaning you can control your 3D printer from anywhere with an internet connection. Safety Certification: All FlashForge 3D printers have been CE, FCC and RoHS certified to ensure safety and quality. ​Warranty: 180-Day manufacturer’s warranty. Warranty extensions are available through the company ProCare Extended Warranty program. ​​So which of the two 3D Printers is best for your needs? Both 3D printers considered here are excellent products designed for home use requiring minimal setup that will allow you to start printing quickly in a very safe environment. They are similar in a number of ways; in particular, they both use only PLA filament and have a single extruder. However, they also present a number of differences that might be important depending on how you want to use the printer. Flash Forge Finder supports Wi-Fi, so it can be controlled from wherever you may be. There is no Wi-Fi support with Dremel 3D20. If a Dremel 3D printer with Wi-Fi support is needed, we recommend the Dremel 3D40. FlashForge Finder can also be equipped with a USB stick which you can use to transfer models to be printed from your computer to your 3D printer. On the other hand, Dremel 3D20 has an SD card slot, so you can use an SD card (up to 32GB) to transfer from your computer to your 3D printer the models you want to print. Dremel 3D20 can also be connected to your computer with a USB cable. In the following section, you will find Amazon links for the 3D printers described above which you can click for exact price information or to purchase.